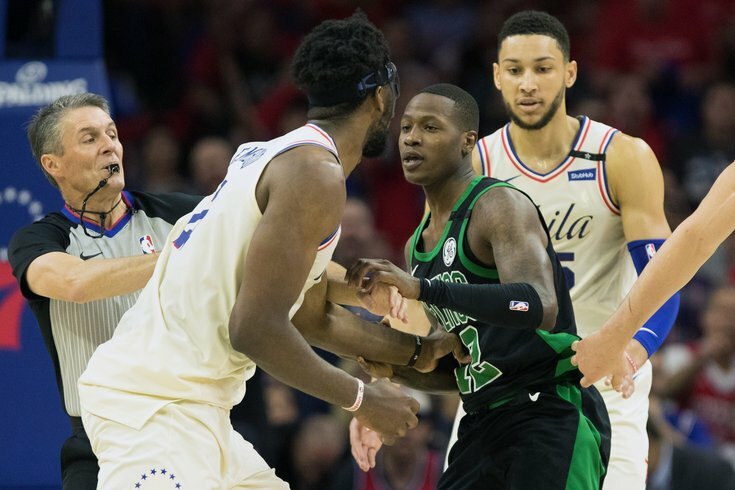 Philadelphia 76ers center Joel Embiid and Boston Celtics guard Terry Rozier get into an altercation during the second quarter of Game 4 at Wells Fargo Center. Boston and Philly have reversed roles. This past winter, Philadelphia was the underdog. Without its best players, with the critics giving them almost no chance, with Vegas odds piled against them, the Eagles rallied around Nick Foles (you might know him better as Saint Nick) and won their first ever Super Bowl over the heavily favored Patriots. And they did it in true underdog style, masks and all. Fast forward three months and another playoff showdown between bitter rivals from Boston and Philadelphia has taken center stage – but this time, the team from the north is the underdog. The Celtics have been playing without their two best players in Kyrie Irving and Gordon Hayward. A young head coach in Brad Stevens plays the role of Doug Pederson and a budding era of youth all through the roster. They have been bruised and battered and many expected them to falter in the first round to Milwaukee. After seven games they were battle tested but still underdogs against the Sixers. After three games – all wins (granted, thanks to some rookie mistakes and coaching blunders by the up and coming Sixers) – Boston was still an underdog heading into Game 4. Chances are, heading back to Beantown for Game 5 will finally see the Celtics back as favorites but you never know. Certainly, credit to the Sixers after their 16-game win streak and five-game series win over the Heat is due. The Sixers team the NBA came to recognize over the last two months is hard to recognize this week – but is it the Sixers who are falling apart? Or is it the underrated Celtics sliding beneath the radar to pull an “Un-Philly Special” on a city high on sports for the first time in years? In a Philly-friendly twist, the underdog Celtics, up 3-0, were unable to keep the sleeping giant Sixers quiet for a fourth game. A 103-92 Philadelphia win in T.J. McConnell’s playoff coming-out party gave the team just a little bit of hope (sort of like Tom Brady did in the fourth quarter before he fumbled and the Birds clinched). Even if Joel Embiid wasn’t a lightning bolt of personality and even if Kevin Hart and company weren’t stirring the pot in the stands, the ample bulletin board material seems to have lifted the Celtics just as it lifted the Eagles in January and February ­– following the loss, Boston still has two chances to clinch at home in the next three games. The budding Boston-Philadelphia rivalry could be entering a new golden age. And for fans of The Process, the next Scary Terry vs. Jo Jo bout can’t come soon enough. But Sixers fans better hope the Celtics underdog ride doesn’t get past the Cavaliers in the Eastern Conference Finals. Otherwise, Boston fans will be feeling back on top again.